Hormones and weight gain go hand in hand. I have a pituitary disorder from an accident that injured my brain. That injury also affected my hormones which in turn affected my weight. I also was diagnosed with the Epstein Barr Virus at 15 years old. The EBV has a negative impact on the thyroid, which also affects weight, energy levels, and mood. 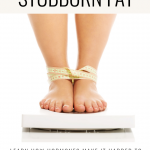 I know so many of my clients struggle with weight gain and suspect their hormones are to blame. 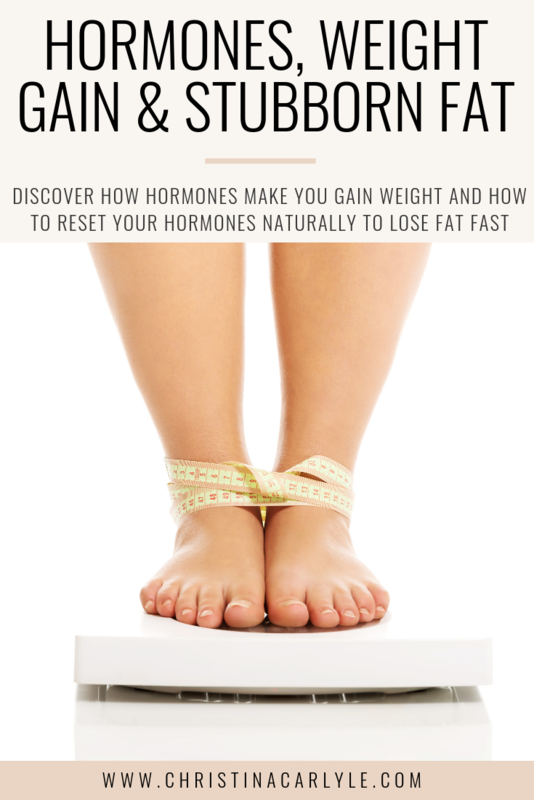 If you feel like your hormones are making it harder for you to lose weight, chance are you’re right! But there’s good news! You can regulate your hormones and lose fat quickly when you give your body what it needs. That’s what this post is all about! 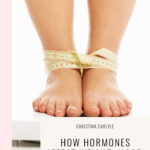 I’m going to break down everything you need to know about hormones and weight gain. Then I’m going to share tips on how to balance hormones naturally to feel more motivated, get healthy, and burn stubborn fat. Hormones are the chemical messengers that regulate all of the bodily functions throughout your body. Your hormones are responsible for making sure you get the right things you need to function properly and stay healthy. Hormones also influence weight gain because they are a part of the metabolism. The metabolism is the sum of all chemical reactions happening within you. That means if something is going on with your hormones it’s also impacting metabolism, which is how it starts affecting your weight and can cause weight gain. When your hormones become affected and they starts to disrupt the metabolism. 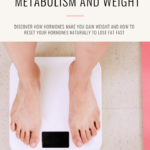 Whenever hormones imbalance the metabolism’s normal functions start to dysfunction which is when weight gain typically starts. If one hormone becomes imbalanced they can have a domino effect and cause imbalances in other hormones. If you’re experiencing issues with your reproductive hormones, menopause, food cravings, fatigue, irritability, PMS, and your weight there is a big chance that your hormones may be imbalanced. It’s difficult to get motivated to lose weight, eat healthy, exercise regularly, and lose weight when hormones are being affected. Hormones have an impact on mood, energy levels, and your ability to burn fat and feel control over food. It’s difficult to lose weight when you don’t feel great and you’re hungry all the time, you feel me? 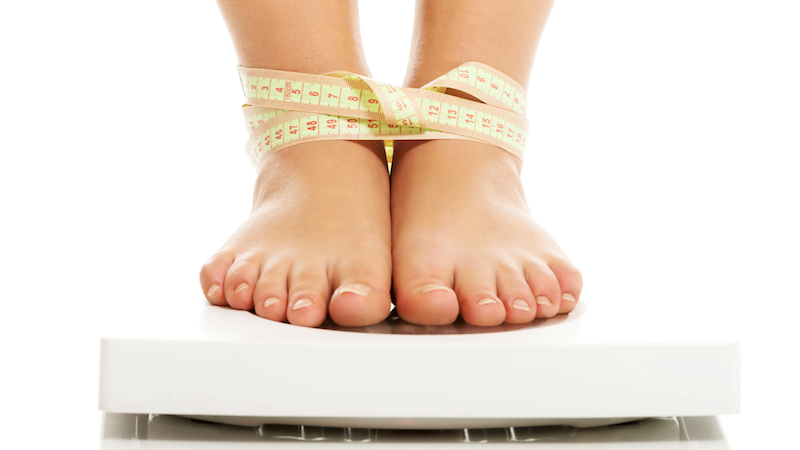 Keep in mind that it’s possible to lose weight when hormones are imbalanced. You have to be in a calorie deficit to burn fat BUT, it’s possible to gain weight even when you’re in a calorie deficit when your hormones are imbalanced. Hormones can cause weight gain even if you’re dieting and exercising like a pro! 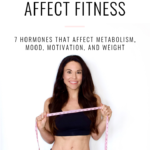 There are 7 main hormones I focus on when my client’s are struggling with stubborn fat, motivation, mood swings, and weight gain. They are the hormonal superstars that regulate metabolic functions, namely hunger, satiety (feeling satisfied), and if you’re burning or storing it. These 7 hormones literally make or break your ability to lose weight and feel great. If any of these hormones is imbalanced, you can gain weight because they start to impact others. 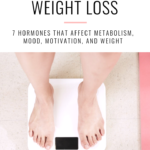 This is an overview of how these 7 hormones impact your mood, energy, metabolism, and food choices which can ultimately lead to weight gain and stubborn fat. Too much stress and sleep affect these hormones that trigger weight gain, too! (more on this below) That means dieting and exercising like a pro, but you can gain weight if you’re not sleeping enough or you’re too stressed. Leptin tells your brain that you’re full and regulates metabolism so you burn more fat when your body needs to. You need at least 7 solid hours of sleep so your brain knows you’re okay and will sustain natural metabolic (hormones) functioning and balance. The Journal of Clinical Endocrinology and Metabolism concluded sleep duration influences leptin production, because “sleep modulates a major component of the neuroendocrine control of appetite.” That means poor sleep can affect your hunger and eating before bed can affect your ability to sleep! Cortisol is a stress hormone. It’s responsible for a temporary adrenal burst for ‘flight or fight responses.’ It’s also released when you’re feeling stressed out: stuck in a traffic jam, freaked out about finances, or because you’re not getting enough sleep. Chronic exposure and elevated cortisol levels trigger your body to store fat and break down muscle which can make your metabolism slow down. Stress can also cause food cravings! That’s because when fight or flight is activated, other survival instincts like ‘feast’ are activated, too! Stress makes the body activate survival mode. Sugar is the #1 thing you’ll crave in survival mode! 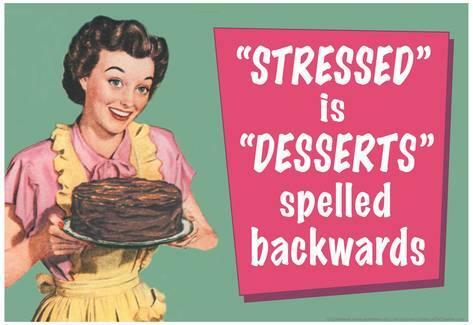 Ever hear ‘stressed spelled backwards is desserts?” That’s why! You can also experience stress internally if you exercise too much, eat too many toxic, inflammatory, acidic, processed foods, or think too many negative thoughts. Consumable products, environmental factors, and ‘things’ can trigger cortisol and so can your thoughts! A study titled “Sleep Loss Results in an Elevation of Cortisol Levels the Next Evening” found that cortisol levels should occur in the morning so the effect can taper off throughout the day. High cortisol levels could increase stress more, further impairing your ability to think clearly, cope with life events, sleep, and metabolize food properly, which can lead to nutrient deficiencies and more metabolic dysfunction. All of which, can slow the metabolism and have you tossing and turning well into the next night… this keeps you stuck, struggling to lose weight and feel motivated and energized. People that are tired tend to eat more to cope, which negatively affects the next hormone, ghrelin. Ghrelin kinda sounds like ‘grumbling’… as in, my tummy’s grumbling. Which is exactly what ghrelin does… it signals hunger. Normal ghrelin levels make you feel hungry. But too much ghrelin can cause chronic hunger, cravings and the urge to overeat. Women who get little to no sleep, are overly stressed and have hormone imbalances are more susceptible to higher than normal ghrelin levels. Excess ghrelin can be responsible for cravings and mood swings. Ever feel more hungry when you get stressed, cranky, ovulating or about to get your period? Yep! That’s ghrelin! A study in the Journal of Sleep Research showed that just one night of sleep increased ghrelin levels and hunger in healthy normal-weight men. Stress and reproductive hormones spike ghrelin, even more, making it harder to stay motivated and lose fat. This anti-inflammatory hormone helps regulates several metabolic processes including breaking down fat. Inflammation can occur from over-exercise, eating processed foods, acidic foods, and trying to heal an injury. You can also get inflamed when you’re too dehydrated, stressed and tired! Whenever inflammation occurs, the adiponectin hormone slows the metabolism, stops fighting fat and starts trying to repair, heal and reverse inflammation instead of burning fat! Insulin is one of the most powerful hormones that affect your ability to gain or lose fat. Increased insulin levels prevent the metabolism from burning fat entirely and can trigger fat storage. Eating too much sugar, literally causes your fat cells to slam shut like a Venus fly trap, trapping fat in your tissues. Every time you eat sugar you’re triggering insulin production. Plus, insulin affects other fat fighting hormones. A study in The Journal of Applied Physiology concluded chronic stress and poor sleep habits increased hunger and sugar cravings and directly contributes to weight gain, insulin resistance, and diabetes. Glucagon does the opposite of insulin. This hormone releases fat from your fat cells to burn for energy. If your insulin is off balance, glucagon has a harder time releasing fat so it can be burned for energy. A study in The Journal of Clinical Endocrinology and Metabolism concluded that poor sleep and dietary habits also reduce circulating levels of glucagon. Your body makes this “fountain of youth” hormone that is released only during deep stage 4 sleep. Growth hormone (GH) also helps build muscle, boosts energy, motivation, and improves fat metabolism. A 1991 study in the Journal of Psychiatry and Neuroscience showed fewer hours of sleep resulted in less GH. This is an issue because muscle mass can only be increased during repair or ‘recovery’ and muscle mass helps boosts the metabolism. If you’re not getting enough GH your muscle mass can deteriorate, reducing metabolic rate. When you’re too stressed, eating processed foods, consuming too much caffeine or exercising too close to your bedtime, it can disrupt your deep sleep cycles and ability to maintain metabolism boosting muscle mass. This can lead to weight gain and feeling unmotivated. As you enter your 20’s Growth Hormone declines naturally as you transition out of puberty. This is why people gain the ‘freshman 15’ in college. But, you can imbalance hormones at any age! If you’re too stressed, don’t sleep enough, or eat too many processed foods you can affect hormone function. If left untreated, hormone imbalances can get progressively worse and affect health, mood, and weight as you age. Menopause can make you gain weight, too. As you age, hormone production slows down, slowing the metabolism along with it. Estradiol which is a form of estrogen decreases naturally during menopause as a woman’s body transitions out of the reproductive cycle and child bearing. Estradiol helps to regulate metabolism and body weight. Lower levels of estradiol may lead to weight gain. Pin this post to Pinterest so you’ll have it forever. A lot of women gain weight and feel awful during menopause for a few main reasons. They had other hormones off balance prior to shifts in reproductive hormones. Once estrogen levels drop, they have a trickle down affect on other hormones that affect hunger, mood, and energy levels that make it harder to stay positive, motivated and in control over food. 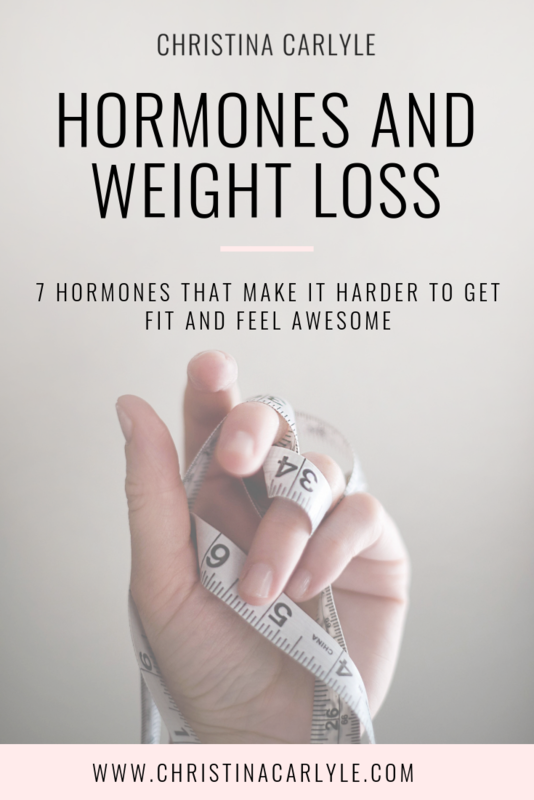 They were too stressed and/or weren’t getting enough sleep or essential nutrition needed to regulate and sustain natural hormone and metabolic functions after estrogen declines, resulting in metabolic dysfunction and weight gain. They didn’t strength train regularly to preserve muscle mass needed to sustain an elevated metabolic rate. If you’re looking for fat burning, metabolism workouts for women, I got you! A lot of people think they only have to ‘eat healthy’ and ‘exercise’ to lose weight and stay healthy. That’s not true! You have to drink enough water (water is an essential macronutrient! ), reduce stress and get plenty of sleep to keep your hormones balanced and lose fat, too. 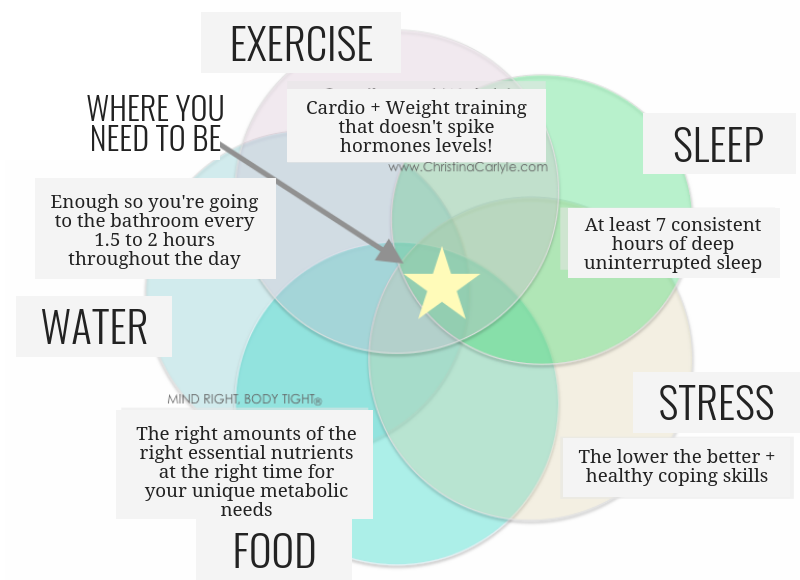 When you’re not eating right, not exercising, not getting enough water… if you’re too stressed and not getting enough sleep you’ll disrupt hormone functions. There are 5 factors that you must balance, to ensure normal hormone production. To stabilize hormones, it’s best to keep these 5 factors balanced. Otherwise, you’ll stay stuck struggling with a slow metabolism, food cravings, fatigue, and stubborn fat. 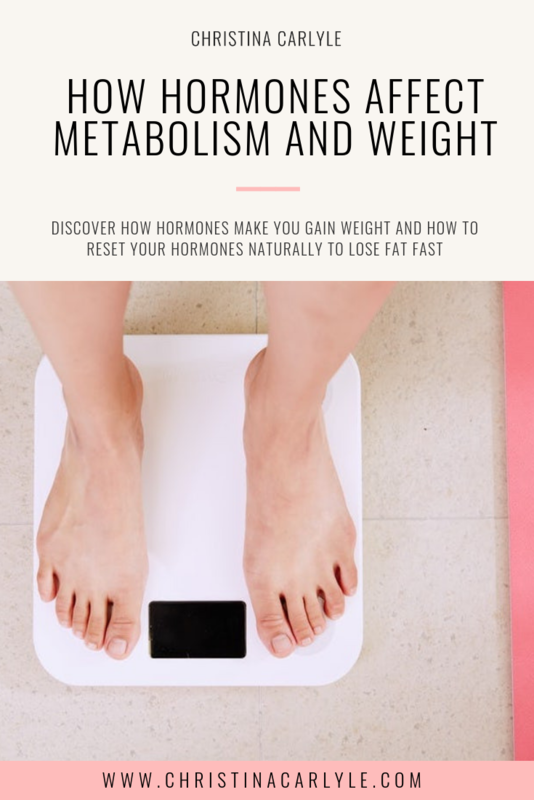 When you’re not getting enough of one or more of the 5 factors, your body will slow your metabolism and one or more of the 7 hormones mentioned above, will be released to try to correct the problem. When hormones are released to correct any of the five factors, it can cause a ripple effect throughout the other hormones. It doesn’t matter if you diet or exercise like a pro… if you’re not drinking enough water or you’re too stressed… you can experience hormone imbalances that cause gain weight. 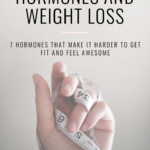 The hormones that are affected by the 5 factors and how they react differently to different things varies and is determined by your bio-individuality (genetic makeup and metabolic reactions to food, stress, exercise, and sleep). There is hope! Hormones can be regulated quickly with food and minimal exercise! I hope this post helped you! 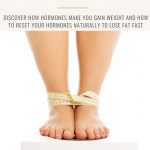 Do you think your hormones are affecting your weight? Let me know in the comments. I love to hear what you think! It helps me create more helpful content to help you lose weight and feel great! Originally, posted July 14, 2013 – updated August 18, 2018.You may also like this popular post about fitness motivation. Christina this is more of a question than a comment. I have a gluten sensitivity but I do not have Celiacs. Would I be able to follow the diet and still loose weight? I am 55 and just found out this past summer. But eating gluten free has not helped me loose much weight. I am a stress eater. What kind of hormone tablets? What’s your diagnosis? what do you think about eating beans ?? That depends on a lot of factors… Why do you ask? Offhand they’re okay, but they’re really starchy and not my first choice for a plant based protein. I have gastroparesis and I’m a type 2 diabetic. I’m 28 yrs old and about 30 pounds over weight. I cant eat meat, or tofu, fruits or veggies unless pureed (which after cooked soft and pureed, they have lost their nutrients) I cant eat nuts seeds or skins, because all these things don’t get digested in my stomach and will sit there causing pain until I’m able to throw them all up, and I’m lactose intollerant but since it’s one of the few ways I can get protein, I have around 2 servings of dairy a day (via of low fat cottage cheese=24 grams protein) I get 30 grams of protein in a day if I’m lucky and have vitamin d deficiency. I have general anxiety and depression that I battle daily. I’m a poor sleeper and have difficulty drinking enough water (too much makes me feel sick) I have to limit my fats and restrict my fiber. Foods I tollerate the best are starchy or full of carbs. Whatever I eat take around 10 hours to digest, and besides not consuming many nutrients I don’t absorb them properly either. Anything on that list I can eat? You need to supplement!! You sound very nutrient deficient. Hi Christina, how do you feel about the “whole 30?” that way of eating literally saved my life, I was doing everything wrong! Than by chance I happened open this book, and now down 12 lbs and counting . I now follow a Paleo style of eating and I feel so amazing. ? Whole 30 & Paleo are pretty much the same thing and match my philosophy… don’t eat processed, fake foods! I think it’s vital to address those who are on Tamoxifen, to suppress œstrogen and Zoladex to keep you in menopause!!!! I am almost 46 and I am really struggling with my weight. Two years ago my doctors recommended a hormone pellet that I have been having put in my hip since then. She said my testosterone levels were super low and that my thyroid is borderline low so we needed to watch it. Since then I have been trying to work out and eat better but I am not seeing any results no matter what I do. I bought some Advocare Meal replacements shakes to try and replace breakfast or lunch with one of these shakes. Five years ago I did weight watchers and lost about 60 lbs but I have put it all back on and i am not a lazy person I am always moving and doing stuff. I feel horrible about myself after loosing this weight and now putting it back on but I really think it has alot to do with my hormones and I have restless legs so I do not sleep well. About 4 years ago I got a blood clot in my leg and ended up having a pulmonary embolism after that I stopped having my period and then I started to gain gain gain and I have always been very small I have been dieting and walking daily but nothing’s really helping would my period stopping at age 30 have anything to do with my weight problems? Hi Jessie I’m so sorry for what you’ve been through. That doesn’t sound fun at all. :/ It’s hard to tell… hormones and weight work closely together… but whatever is causing your period to stop may or may not be related to your weight. 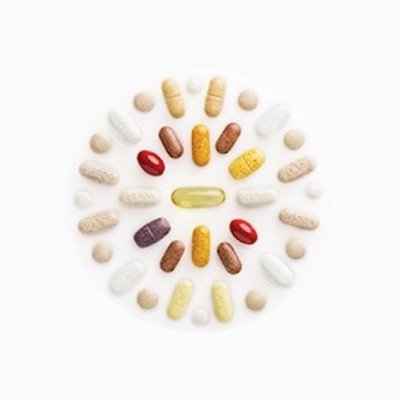 Medication related to treatment for your PE (if you took any) may have an affect, too. I’d recommend talking to your doctor about it to try to drill down on the root cause. I hope you find it. See a doctor… weight loss (without dieting/exercising) can be a sign of a much bigger – and potentially life threatening – problem!! This is a really interesting read. Apologies if this seems like an obvious question, but would a regime focusing on the relationship of our hormones to weight-gain and loss then be aligned to each individual’s menstrual cycle too? Our clients also benefit from hormone testing – do you find this of value too? No and no/depends. I don’t focus on a regime for reproductive hormones. Reproductive hormone/menstrual cycle issues mean there’s something affecting the endocrine system. I address the endo system as a whole and resolve root causes of my client’s issues… not just estrogen/progesterone/testosterone/fertility. With regards to other hormone tests sometimes I recommend some based on symptoms my client is experiencing to rule out thyroid/adrenal concerns. I typically don’t rely on testing first as false negatives are extremely common and it can take WEEKS to get results back… and tests are a snapshot in time… and hormone levels can change every week based on a cycle/stressors/food/drinks. I find a lot of people are quick to push expensive tests without deep dives into history/habits. I dig deep and use proven protocols with zero side effects that can be started right away… not waiting until results come back to recommend something. I get my clients feeling great and losing weight ASAP and save them time and a ton of money. I want to read and see video on your blog but it’s an empty space! Do you know why? I have been on Citalaphram for 11 years for anxiety and depression. I’ve always been thin, then the weight and fatigue kicked in once I started taking this medication. I have to take it, definitely helps my well-being over all, but I feel quite sluggish and struggle to get modivated to exercise. Eating clean but I want to regain my strength and tone. I am 59 and I need to lose 40 lbs. How can I balance these hormones with this medication in my system?